In my introduction to table functions, I showed how to build and "query" from a table function that returns a collection of scalars (number, date, string, etc.). If that's all you need to do, well, lucky you! 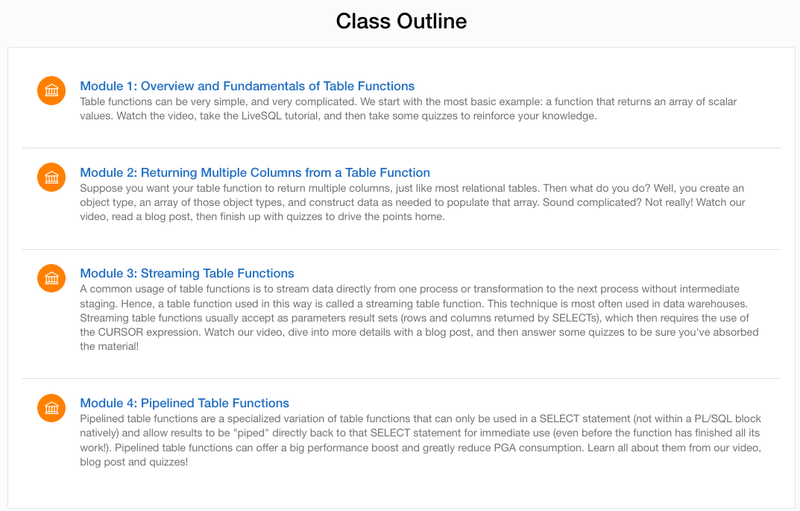 This post explores how you can go about doing that with table functions. Let's take the very simple example above: return an ID and a name. Let's further assume that this data is not readily available from a table - we need a table function to put it all together. Actually, well, "what". Not very slick at all. Ugly. Cumbersome. Error prone. What if, for example, an employee's name was hyphenated, as in "Silva-Feuerstein"? So, yes, sure, you could take this approach when you need to pass back multiple values per row, but it's awfully kludgy and will not enhance your reputation with other developers on your team. 1. Create a nested table type based on the record type. Yes, well. Let's face it: PL/SQL is very gracious about understanding and leveraging PL/SQL. SQL, on the other hand, is a bit arrogant. Sure, it will recognize and execute functions declared at the schema level (CREATE OR REPLACE FUNCTION) or in a package specification. But outside of that, SQL really doesn't want to have anything to do with PL/SQL. OK, kidding aside. It is worth remembering that "PL/SQL" stands for Procedural Language extensions to SQL. So of course it must know about and support SQL - that is, in fact, one of the most wonderful things about PL/SQL: native support for SQL. But SQL exists independently of PL/SQL and so it would make sense that it does not recognize a whole boatload of procedural constructs from The Language That Changed My Life. Bottom line: you cannot reference a PL/SQL record type (even one defined with %ROWTYPE against a database table) as the datatype of a schema-level nested table. Bummer, 'cause that's a fast and easy way to do things. Instead, I must dip my toe into the world of object-oriented programming in PL/SQL and create an object type to serve as the base datatype for the nested table. Now, if you are one of the 99% of PL/SQL developers who are not comfy with object orientation and have never had the inclination or reason to learn about PL/SQL's OO features, don't worry! You will not have to do so in order to use object types with your table functions. You will, in essence, create an object type, just like you create a relational table or a record type, defining an attribute (analogous to a record's field) for each distinct value you want returned in the row from the table function. To do this, you do not need to understand object-oriented principles, nor pretend to get all excited about dynamic polymorphism. 1. That hard-coded COLUMN_VALUE is no longer a part of the equation. The names of the object type attributes become the names of the "columns" in the SELECT list. You can reference those names in the WHERE clause, ORDER BY clause, etc. 2. In this latest table function, I took advantage of the constructor functions that come with both nested tables and object types to set all the desired values to be returned by the table function right in the declaration section. This is not something you can do with records and associative arrays. That's very handy, but practically speaking will not likely be the way you build your datasets within a table function. So now you know the secret handshake: when your table function needs to return rows with more than one column, create an object type that defines the desired structure, build the nested table on that object type, and then have the table function return a collection that that nested table type. But I was doing a presentation on this subject at the OUGN conference and someone came up to me saying: that isn't quite true. I tested this on Oracle 10G (10.2.0.4.0) and 11G (11.2.0.2.0) and it works as he told me. Thanks to Kristian Saksen for pointing this out to me. Thanks, Patrick and Kristian. Yes, for pipelined functions that exception holds: you can use a package-based nested table type and then you can use %ROWTYPE to define the return type. I will point out that exception in the [corrected] post. and, as such, Steven's statement is correct. to be a "schema-level nested table". Thank you! You are the best teacher.